A package arrived for me today via Fed Ex and it contained this 10 lb. Reebok kettlebell and a DVD that has 2 workouts on it. I had a quick look at them both... beginner and intermediate, and I think I can do them! Gonna give it a try tomorrow. It is Swiftsure weekend here... that means the Inner Harbor marina is full of beautiful sailboats and the city is crawling with professional sailors and American tourists. The energy is amazing and I love it. Swiftsure is the biggest race in the Pacific Northwest. The action relies completely on the weather conditions. We are getting things set up at the new apartment, slowly but surely... and I am loving being able to pick herbs and veggies out of my container garden pots and use them to cook dinner. So far I have harvested cilantro and bok choy. I love living across the street from an amazing park with several small lakes, colonies of herons in the trees, Canada geese, mallard ducks, squirrels, peacocks, and fresh water turtles... It is fun to be able to watch the action from our own windows or wander over to get a closer look. 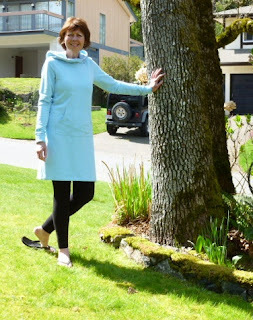 I am really loving the Titika Activewear Harlem Hoodie which is one of the items I selected with my $200 gift card win on their February Twitter promotion. Titika is a Canadian company and I love their clothes. In this picture I have the sleeves rolled back, but there are thumb holes in the very long sleeves and I just think they are soooo cool. And notice what color it is? Last night my brother, who lives in CA, called to wish me a Happy Birthday, and I talked with my nephew, who is going to be 16 in a few days, for quite a while. It was so enjoyable as I haven't seen them for a couple of years and I loved catching up on his news. He is so grown up, almost through grade 10, and planning an Air Force career. I am so excited for him and so proud of my baby brother for raising such a great kid. And, I saw my doctor this week about the leg swelling and had some blood tests done which rule out blood clots and the possibiltiy of DVT... which is a huge relief. I am going to be doing some follow up to find out what is causing the edema but that is another story. On another note, The Captain and I haven't been for a run since I survived we ran our half marathon on May 13th! Tonight I will be mapping out a new route in the neighborhood for us to run on Sunday. Looking forward to seeing how the legs work. Wish me luck! What are you excited about lately? Excited, after just over 2yrs of swimming, to be doing 200m fly without the aid of my beloved fins. I love the stroke & want to swim it in a gala next season (your winter) so my coach decided to aim for the 200m-event. I was stunned but have decided he has faith in me so I must just believe and put in the v hard training he's got me doing. Every bit of progress keeps me excited. Good luck with your first run! I think that one is the best. You can take it slow and easy and just have fun with it! Wow, you have lots to be excited about:) I hope your run goes perfectly and your hoodie is so cute:). Have a great weekend! How do I not know about Titica? I'm Canadian and into exercise wear! Thanks for this tip; heading over to their website now! I love potted herbs! Hope your first run back goes well! I'm so inspired by everyone growing things lately, I tackled my jungle of a garden yesterday. Your herbs look pretty! Enjoy. Still keeping you in my thoughts and prayers about the leg and hoping it's nothing serious! The hoodie looks really good on you and makes your legs look even longer. Very cute! The park across the street sounds beautiful. I'm sure you and The Captain will get to enjoy many hours there. I am LOVING that Titika piece on you! The colour is amazing! I love kettle bells and think you are going to have a really good time with that! There are so many different exercises you can do with them! Oh, Elle! I LOVE this post. First, you look so beautiful!! I love that picture of you and the color of that outfit is beautiful on you. As you know, we have been growing a lot of cilantro. I LOVE fresh cilantro. One of the things we like to do with it is put it in Basmati or Jasmine rice with a squeeze of lime juice. The other night Michael did that and then we made burritos, but I was thinking that kind of rice would also go well with your shrimp curry recipe that I like to make it. It would be a nice, refreshing addition, I think! I LOVE the turtles - they are so cute!! Can you see them from your home? I would be watching them all day, I think. We have turtles in the pound out front, but they rarely come all of the way out of the water so I can only see their heads. I don't know when your birthday was for sure, but I gather I may have missed it. Happy belated Birthday, my friend!